However, among Hispanics themselves, many are ambivalent about the two terms. According to a new Pew Research Center survey of Hispanic adults, half (50%) say they have no preference for either term. 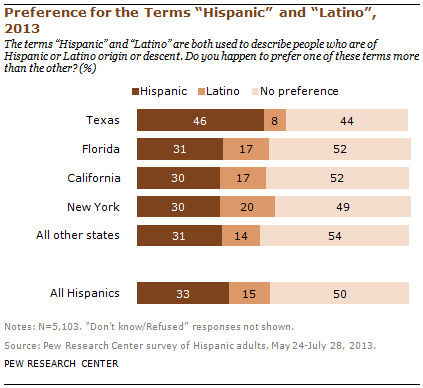 But among those who do have a preference, “Hispanic” is preferred over “Latino” by a ratio of about 2-1. But there’s one striking exception: Texas. Among Hispanic Texans 46% prefer the term Hispanic, while just 8% say they prefer the term “Latino”—roughly a 6-to-1 ratio. This pattern is different from that of Latinos in other parts of the country. For example, in California, the state with the largest Hispanic population, 30% say they prefer “Hispanic” and 17% say they prefer the term “Latino.” In Florida, results are similar—31% prefer “Hispanic” and 17% prefer “Latino.” The pattern for New York and all other states is nearly the same. It turns out this is true of Hispanics in Texas as well: about half (47%) say that they most often use their Hispanic origin term to describe themselves, 30% use the term “American,” and 21% use the pan-ethnic terms “Hispanic” or “Latino” most often to describe their identity.